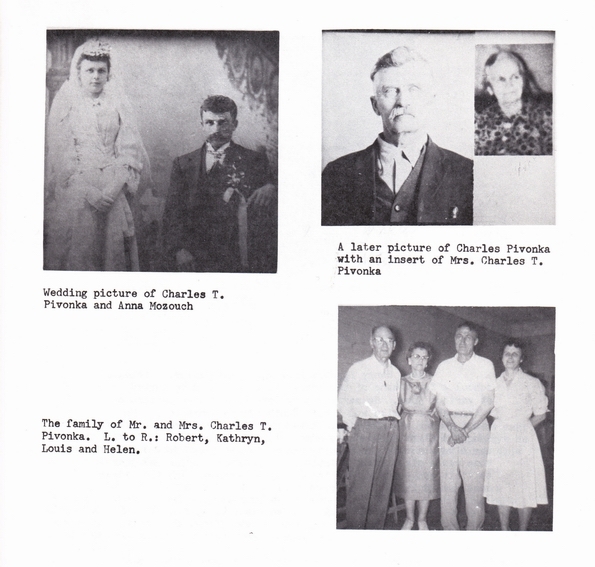 Charles Thomas Pivonka was 13 years old when he came to America with his parents, an older sister and four younger brothers, in 1880. He worked on the railroad when he was older and in 1895 married Anna Mazouch, at Olmitz, Kansas. He had homesteaded and they lived on a farm five miles south and two and one-half miles west of Timken, until 1916 when they moved to Great Bend, Kansas. Robert, Kathryn, Edward and Louis were born on the farm. Edward was born February 2, 1906 and died August 3, 1906. Helen was born in Great Bend. Charles had retired from farming but he had a large garden and fruit orchard and did carpenter work. He had only a 6th grade education but read a lot, and had taught himself to play the clarinet and violin. He was a member of the Timken Band and Great Bend City Band. He was active in the Knights of Columbus in Great Bend and served on the Church Committee for St. Rose Church many years. He was a Catholic all his life.